Moving, holidays, exhibition. The cat in the train – the Luggage or the passenger? To avoid problems with the guides, if you are traveling with a pet, follow the rules of transportation of animals on railroads. To take care of the legitimate transportation of cats should be at least a month before departure. This is due to quarantine: the animal can not be exported earlier than one month after vaccination against rabies. Contact the state veterinary clinic (the station for combating animal diseases) at the place of residence. Rabies vaccination will do for free, but find out in advance, it is possible that such vaccinations are performed in your city only on certain days. Take a certificate stating that the vaccine was made. If your cat designed veterinary passport, a note on vaccination against rabies do on the designated page. A day or two before departure, get to the regional state clinic help your pet. It make the data of the form (a cat), number (multiple cats you can take one reference) and age of the animals, as well as a note of the fact that the animals have passed the quarantine "habitat". The certificate is valid for three days or until arrival at the destination (it should also be stated in the certificate), if it takes more than three days. At the exhibition you will need the same certificate and veterinary passport. The rules of the Russian Railways provide for the transportation of small animals in open carriages, in cells carrying as hand Luggage. 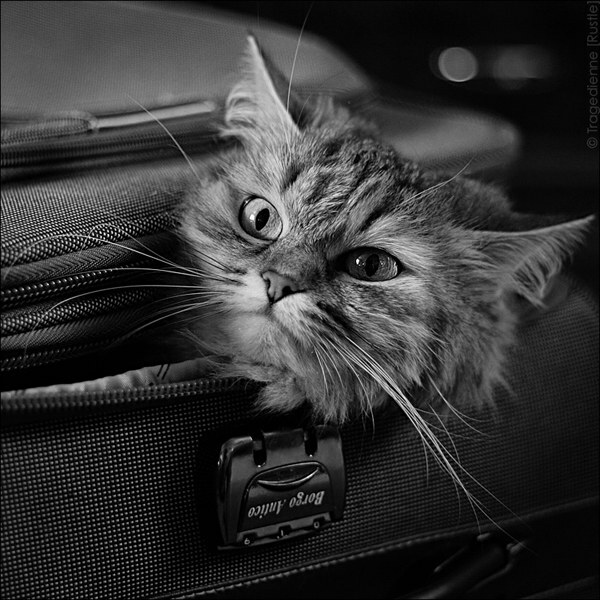 For cats need to buy Luggage ticket (such as for 20 kg of Luggage). The conductor will check your tickets and a veterinary certificate. When the road ahead is far, stock up on food, tray, wet wipes, boiled water and a small stable bowls for food and water. If you spend less than a day, the cat is better to starve. Hold the cat on the train and not leave it unattended. Even in coupe cat can escape through the vents. In advance put on a cat harness and take the leash with a simple and durable rifle.